Are Republicans the “Stupid Party” or the “Big-Government Party”…or Both? You can forgive someone for not being intelligent, after all, but it’s much harder to look the other way when they deliberately and knowingly do the wrong thing. And that seems to be a good description of how the GOP handled the recent farm bill. First, some background. 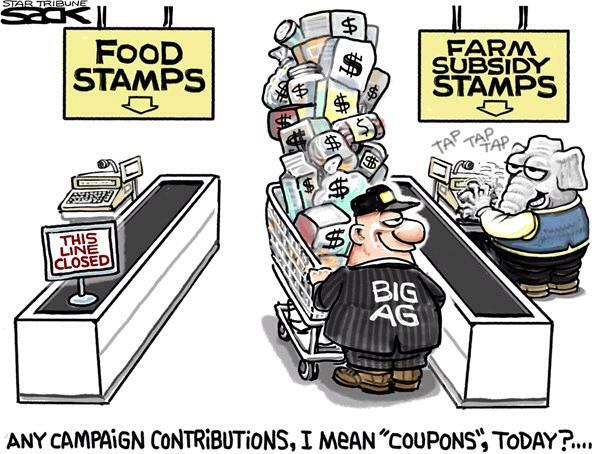 The farm bill traditionally has also been the legislation that funded food stamps. The special interests adopted this approach because it created an unholy alliance of big-city Democrats and farm-state Republicans, with both groups agreeing to support each other’s wasteful spending. Advocates of smaller government have long objected to this arrangement for the simple reason that neither agriculture subsidies nor food subsidies are proper functions of the federal government. So it seemed like good news when the House of Representatives defeated a $1 trillion farm bill last month. And it seemed like even better news when House GOP leaders announced that they would separate the farm subsidies and food stamps into separate pieces of legislation. But here’s where we run into problems. The insiders and special interests who are cozy with the GOP used this new approach as an excuse to increase the role of the federal government! I’m not joking. Darren Bakst of the Heritage Foundation explains what happened. When the House leadership first announced it would separately consider the food stamp and farm components of the “farm” bill, it looked like they got the message that current farm policy was in dire need of reform. With separation, real reform to rein in market-distorting programs and special interest handouts could finally happen. But now that separation has occurred, they’ve forgotten the very reason why separation was needed in the first place. …With the passage of this bill, the House has gone even further to the left than the Senate bill. It would spend more money than Obama on the largest farm program, crop insurance. …In fact, they made this new bill even worse—by making sneaky changes to the bill text so that some of the costliest and most indefensible programs no longer expire after five years, but live on indefinitely. This means the sugar program that drives up food prices will be harder to change, because it doesn’t automatically expire. It also means the new and radical shallow loss program that covers even minor losses for farmers will indefinitely be a part of the law. To be fair, there were a few changes that arguably moved the ball in the right direction. Here’s what the Wall Street Journal opined. The new farm bill still has more subsidies than is desirable, especially amid a booming agriculture economy and record land prices. The supports for prospering sugar and dairy farmers are especially dreary. Republicans defeated a proposal by Budget Chairman Paul Ryan to put income limits for receiving subsidies, so “farmers” with non-farm incomes of nearly $1 million a year can still dun taxpayers. But at least the bill spends $20 billion less over 10 years than current law. One major reform is the repeal of a 1949 law that reinstates New Deal-era production controls and price supports if Congress failed to pass a new bill. I’m not an expert on agriculture subsidies, but I think the Heritage Foundation has a stronger argument. In any event, it’s unambiguously true that House Republicans didn’t use this opportunity to approve big, pro-market reforms. Moreover, the Republicans have left themselves wide open to the charge that they’re perfectly happy to subsidize rich contributors while not subsidizing those with modest incomes. Ross Douthat was very critical of the GOP ploy in his New York Times column. It should go without saying that America’s agriculture policy has always been a terrible, stupid, counterproductive exercise in self-dealing cronyism. But when House Republicans severed the traditional connection, arbitrary but politically effective, between farm subsidies and food stamps, it briefly seemed like they were looking for an opportunity to put libertarian populist principle into practice, by separating both outlays in order to trim or reform both separately. But no — instead they were just making it easier for the party’s congressmen to vote for a bloated, awful big government program that benefits mostly-Republican states and interest groups, knowing that they weren’t also voting for something that pays out to the (mostly-Democratic) poor as well. This is egregious whatever you think of the food stamp program… Practically any conception of the common good, libertarian or communitarian or anywhere in between, would produce better policy than a factionally-driven approach of further subsidizing the rich. Sort of confirms my argument that the worst people in Washington are GOP insiders. Needless to say, this approach creates a big opening for the left, as illustrated by this cartoon. But the reason this cartoon is effective is that it is based on reality. Republicans did push through a wasteful farm bill. And they don’t have any plans to deal with the food stamp component. And even though there will be some agreement on food stamps, the GOP has left itself open to the charge that they want handouts for their rich friends and nothing for the poor. From a libertarian perspective, I don’t care if Republicans open themselves up to unflattering stereotypes. But I do want to abolish the Department of Agriculture at some point. And I also want to clean up the cesspool of corruption in Washington by shrinking the size and scope of the federal government. Unfortunately, we seem to be moving in the wrong direction and the farm bill is merely the latest example of a very bad trend. on March 16, 2016 at 6:46 pm Farm Bill: Are Republicans the “Stupid Party” or the “Big-Government Party”…or Both? call it “big-government stupid”….. it seems the only hope for the republicans is the tea party/libertarian insurgency… if Rand Paul positions himself well in the next presidential contest he has a real chance of winning the nomination and the general election… wouldn’t that be a hoot……….. So how do we change the status quo!? The betrayal of GOPers is the only thing that makes it worse. While republicans have always found it okay to interfere with lifestle choices, they seem to want to let Market Forces act on their own with minimal oversight. It really isn’t that they do anything worse than the other side. They just want credit for being pro capitalism, when they are anything but. To answer your question – BOTH! The best I’ve seen on “the problem is Big Government not the party in power” is The Great Deformation where David Stockman details the causes of the current situation with most of the blame on Nixon-Shultz-Burns, Reagan-Weinberger, and Bush 2. I don’t agree with his assessment on supply-side economics and the Laffer Curve, but he’s got the hypocritical talk-the-talk but don’t walk-the-walk of the Republican party down. This is another “public choice” example why an incremental approach to cutting the size of government will not work. Every program has a small group of insiders that are highly motivated to expand their own program. But, while the general public sees only the diffused cost of individual programs, when all programs are taken together, it is the majority that is getting screwed. And, because these programs create economic inefficiencies, total losses for the many are greater than total gains for the few. That points the way to a comprehensive solution: Clear away all support programs [with the exception of Social Security, Medicare, and some Medicaid commitments] and use the money to enact a highly progressive flat tax. While initially this will not save a lot of money, it gets rid of the bureaucrats and political manipulation. Because the many will immediately benefit verses the few insiders, such a program will be a huge political winner.